In June of this year, I was invited over to help Sonny. He was then not even a year old but diagnosed with bilateral Avascular Necrosis affecting both hip joints. The vet decided the best plan for his recovery was Femoral head & neck excision. While this condition is common-ish in young dogs, to be affected with both legs at the same time is rarer. It meant that little Sonny could not enjoy being a puppy. He has only known wobbly gaits and compensation for his weak hind legs. The vets operated on one leg in May with the other hip booked in for 6 weeks later. His Mum wrote “It is very important that the muscle and scar tissue around these joints is built up to ensure as good a mobility as possible. Is this something you can help with?” She is already a Reiki practitioner and wanted to combine physical therapy with energy healing to give Sonny as much help as possible. He was also on anti-inflammatory medication. The session was more aimed at training for his Mum to build up the muscles of the leg that had been operated on to help support him for the operation on the other leg. Literally, to give him a leg to stand on! I often get asked what a fit muscle should look and feel like. I use the analogy of a chicken fillet. A high-quality chicken fillet. A Waitrose or Marks & Spencer’s chicken fillet (although other supermarkets are available). The affected thigh muscles of Sonny looked more like a ham slice or lower quality fillet. They needed considerable building up. He had other compensatory issues, including tight neck and overused shoulder muscles. I devised a massage routine plus physiotherapy exercises for his Mum to perform daily. 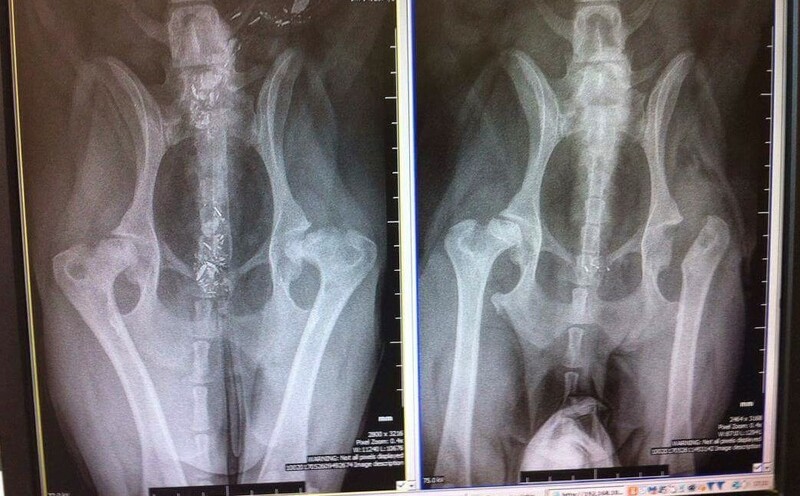 She also sent some photos of Sonny post-operation and allowed me to share his before and after X-rays. Look at the way the femoral head was not fitting in the socket in the ‘before’ picture on the left and how the head was excised in the ‘after’ picture. Here are all the pictures – shared. Poor old Sonny had spent his puppy days with those ill-fitting joints. Physical therapy, massage, exercise, Reiki and medication all working to allow Sonny to run like the puppy he should be on the beach in the Isle of Wight. What a great transformation and testament to the power of complementary therapy. 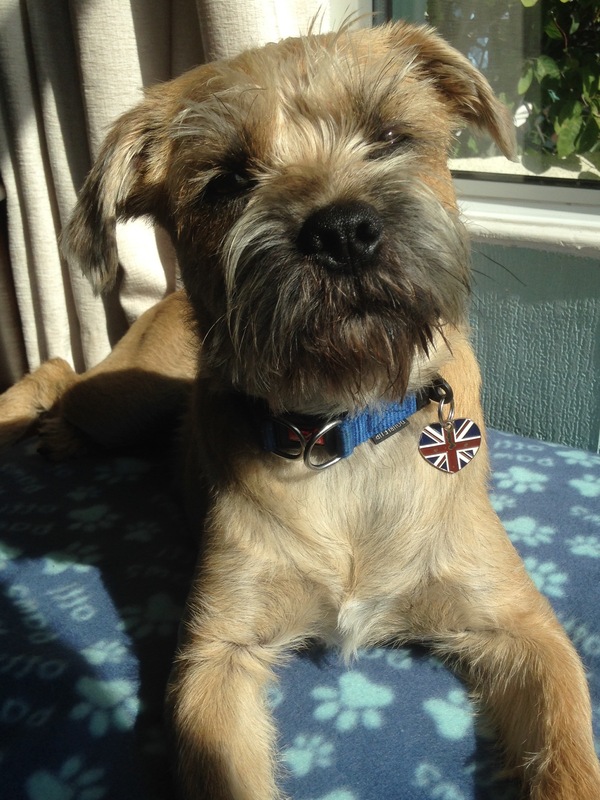 This entry was posted in acheypaw, achy paws, AchyPaw, achypaw myotherapy, Brighton Dog Massage, canine myotherapy, Dog, Dog massage, dog myotherapy, massage benefits, multimodal, multimodal therapy for dogs, Testimonial, Therapeutic, therapeutic massage, training and tagged achy paws, achypaw, achypaw myotherapy, achypaws, Brighton, Dog massage, dog massage courses, dog muscle therapy, massage, one to one training, therapeutic massage. Bookmark the permalink.